All information pertaining to research around the epidemiology and control of both schistosomiasis and geohelminthiasis in Cameroon is collated via work being carried out by: the National Programme for the Control of Schistosomiasis and STH, the Centre for Schistosomiasis and Parasitology and the COUNTDOWN Project. Operated by the Ministry of Public Health in Cameroon, the programme defines and implements the national policy for the control and elimination of schistosomiasis and STH in Cameroon. The centre serves as the focus research centre for the epidemiology of schistosomiasis and soil-transmitted helminthiasis in Cameroon. Both governmental and scientific organisations rely on its research and diagnostic capacity. COUNTDOWN is an implementation research project that brings together multidisciplinary specialists from the UK, USA and Africa to generate knowledge necessary for the control and elimination of the seven most common neglected tropical diseases by 2020. 29 March 2019, Monrovia, Liberia - We were pleased to welcome to the centre, G. Woods, J. Oye, M. Engels, and S. Akongo from Sightsavers together with D. Turgeman, and B. Katzir, from the NALA Foundation who were received by our Director, Prof Louis-Albert Tchuem Tchuenté. During their interaction, they were able to further discuss on opportunities around conducting WASH(Water, Sanitation and Hygiene) and behaviour change. By increasing the momentum around these interventions, we augment the efforts geared towards control and elimination of schistosomiasis and STH in Cameroon. 26 - 28 March 2019, Monrovia, Liberia - The COUNTDOWN Consortium convened in Monrovia, Liberia for the 5th Annual Partners' Meeting. Colleagues in Cameroon, joined consortium members from Ghana, Nigeria, Liberia, LSTM and FHI360 for the 3-day meeting which offered opportunity for members of partner countries to discuss current status, and findings from the in-country multi-disciplinary research projects around neglected tropical diseases. The key impact of these findings on programme delivery and health systems strengthening were highlighted, in addition to the challenges faced and lessons learnt during the course of conducting the multi-disciplinary research. A selection of posters were displayed which presented the impact of research findings, highlighting key topics such as stakeholder engagement, improved affordability and cost-effectiveness of NTD interventions; and improved availability and acceptability of interventions. One highlight of the meeting was a panel discussion where research colleagues shared their country experience on CDD motivation, impact of traditional beliefs on low acceptability, and the when,how and where of drug distribution. 21 - 25 March 2019, Monrovia, Liberia - The COUNTDOWN Social Science team held a writing workshop ahead of the Annual Partners' Meeting hosted in Liberia. This writing workshop brought together 7 team members from Nigeria, Cameroon and Liberia and was facilitated by Dr Kim Ozano and Laura Dean, colleagues from Liverpool School of Tropical Medicine. It enabled colleagues to draft policy briefs and papers from the research undertaken in partner countries. 12 - 14 March 2019, Kribi, South Region - A three-day workshop was organised in the sea-side town of Kribi, in the Littoral Region which brought together national and regional NTDs teams. This interactive workshop allowed for government and non-governmental development organisations to review the 2018 achievements around neglected tropical diseases, as they plan the 2019 activities for the control and elimination of these NTDs. 27 February - 1 March 2019, Douala, Littoral Region - Our teams in Buea and Yaoundé met together in Douala where they partook in a multidisciplinary team working session. 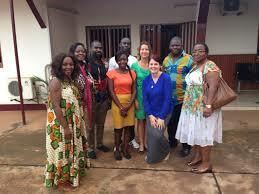 The teams welcomed colleagues, Dr Joseph Turner and Helen Piotrowski from Liverpool School of Tropical Medicine who joined them in conducting cross discipline analysis of data collected from epidemiology,social science, parasitology and entomology research. In so doing, there was a better understanding of the acceptability of Ivermectin and the implications of alternative onchocerciasis treatment with doxycycline on communities concerned. A great output of this workshop was the team's first interdisciplinary paper, around onchocerciasis treatment. 25 January 2019, Njombe Penja, Littoral Region - The Official launch of the 2019 National Deworming Campaign was done at the Government Bilingual Primary School Njombe Penja, in the Littoral Region. This monumental event was presided by the Secretary of State for the Ministry of Health, Alim HAYATOU and the Secretary of State for the Ministry of Basic Education, Dr KILO Vivian ASHERI. The active participation of partners such as the World Health Organisation and other non-governmental development organisations at the launch, demonstrated their high-level commitment to the government's fight against Schistosomiasis and Intestinal Helminthiasis. The National Program for the Control of Schistosomiasis and STH organises these school-based deworming as they are recognised as the most safe, simple and cost-effective solution to controlling these malaises in school-age children, who typically have the highest burden of worm infection. Prof Louis-Albert Tchuem Tchuenté, Permanent Secretary for the control program informed the public of the 70% reduction in schistosomiasis prevalence over the national territory, albeit there still being various hotspots such as Njombe Penja, where transmission persists. By launching the campaign in this locality, the control program ensured a strong mobilisation of national and local authority who assisted in sensitising the population and advocating for positive behaviour change. The treatment target for this year's campaign is 9.2 million people. 14 - 18 January 2019, Yaoundé, Centre Region - As the COUNTDOWN project enters its fifth year, our multidisciplinary teams are focusing on consolidating and analysing research data. In line with their plans research activities for this new year, the Social Science team organised a week-long working session during which they collaborated with their colleague, Dr Kim Ozana from the Liverpool School of Tropical Medicine. The progress made from the applied social science research on shcistosomiasis was evident as the team developed thematic areas, which will guide future publications in line with our strategic research uptake plans. 18 December 2018, Yaoundé, Centre Region - The National Programme for the Control of Schistosomiasis and STH organised a working session at the Ministry of Public Health, in preparation for the 2019 National Deworming Campaign. This meeting which was chaired by the Minister of Public Health brought together key stakeholders such as the Minister of Basic Education and partners engaged in the fight against neglected tropical diseases in Cameroon some of which included Sightsavers, Good Neighbours and Perspective. Prof Tchuem Tchuenté, Program Manager updated participants on the status of schistosomiasis and STH prevalence in the country as STH and schistosomiasis are still significant public health issues. Worms in children interfere with their nutrient uptake, and affect their intellectual and physical development. In order to combat this issue the control program is committed to annually deworming all school-age children (5 - 14years) in all 10 regions of the country. Government and private partners are key players in the success of the national campaigns due to their continuous commitment and support. The 2019 National Deworming Campaign is set to launch late January 2019. 25 July 2018, Yaoundé, Centre Region - The National Committee for the Control of Schistosomiasis and STH held its 8th committee meeting at the Ministry of Public Health this Wednesday. Chairing the meeting was the President of the committee, Minister of Public Health, André Mama Fouda alongside Mrs Youssouf Hadidja Alim, Minister of Basic Education and Vice President of the committee. In presence was the Secretary of State at the Ministry of Public Health, representatives from the World Health Organisation and Good Neighbour and other developmental partners and collaborators of the Ministry of Public Health. The Minister of Public Health welcomed all partners and collaborators while expressing his appreciation for all efforts and continues commitment. The Program Coordinator reiterated the recommendation of the 7th meeting, illustrating how they have been met. By presenting the results of the Schistosomiasis and STH Impact surveys, the significant decrease of schistosomiasis and STH prevalence was evident. Female genital schistosomiasis is starting to gain attention due to its debilitating effects to women especially as it accentuates the risk of being infected with HIV. The Minister of Health, Minister of Basic Education and WHO representative all agreed that there is a need for training health professions and further health education and sensitisation especially for children, using the cartoon "Bambo has Bilharzia", developed by the WHO. 19 July 2018, Barombi Kotto, South West - COUNTDOWN is investigating best ways to expand interventions to ensure all those vulnerable to schistosomiasis have access to Praziquantel treatment. In so doing, these efforts will require governments, researchers and health stakeholders to gather evidence and, where the need arises, revise existing strategies of control to address these needs. 05 - 08 July Yaoundé, Centre Region - The National Coordinator and personnel at the control program were pleased to welcome Pr Jong-Yil Chai, President of the 2018 International Congress of Parasitology (ICOPA 2018) and Korea Association of Health, Pr Keeseon S Eom, Vice President of ICOPA 2018, HooGN Jeoung, Director General of MEDIcheck as well as Good Neighbours officials - Jae Young Lee, Ah Rah Cho and Yoo Sun Chon. It was a very productive meeting as they discussed how to intensity control efforts for schistosomiasis and STH control in Cameroon, through the implementation of a control project. All the while highlighting the current achievement and progress made by the control program in reducing the burden caused by these diseases. As the visitors discussed opportunities for partnership, they also got to to visit the Centre for Schistosomiasis and Parasitology which is the reference laboratory for schistosomiasis research in Cameroon and see first hand its diagnostic capacity in research. Albeit all the progress made in reducing schistosomiasis and STH prevalence, challenges still exist. The Program Coordinator, Prof Tchuem Tchuenté led the Korean delegation to schistosomiasis transmission sites which allowed for a better understanding of the transmission dynamics so as to develop and optimise interventions for the elimination of schistosomiasis. 17 May 2018, Yaoundé, Centre Region - The National Coordinator and personnel at the SCH and STH control program were pleased to welcome the Good Neighbors Project Manager in Cameroon, YooSun Chon who was accompanied by the Country Director, Ah Rah Cho. Good Neighbors is an international humanitarian and development non-governmental organisation and one of the largest in South Korea. One of its missions in Cameroon is centred around improving lives through WASH(Water, Sanitation and Hygiene) education especially in regards to schistosomiasis and STH control. 14 - 25 May 2018, South West and Centre Region - As the COUNTDOWN project nears the end of the first half of Year 4, focus is geared towards data management and analysis. The Social Science teams in Buea and Yaoundé have welcomed their colleague Dr Kim Ozano from the Liverpool School of Tropical Medicine, UK, for a two week work visit. During this visit which comprises a working session first with the team in Buea followed by one with the team in Yaoundé, Dr Kim joins both teams in reviewing progress made thus far in planned research activities. She will support the social science research assistants in properly organising and analysing their data by use of Nvivo. In the South West Region, the Social Science team which is based in Buea and led by Dr Theobald Nji focuses around assessing the acceptability, accessibility and availability of Doxycycline. This drug is being tested as an alternative treatment strategy used to tackle onchocerciasis. Whereas, the team based in Yaoundé and led by Prof Estelle Kouokam, aims to assess the efficiency, equity and sustainability around expanding the access of treatment for Schistosomiasis and STH. Albeit having different research focuses, the Social Science teams in Buea and Yaoundé have shared goals which they continuously strive to attain by the end of the COUNTDOWN project. 06 - 19 May 2018, East and South West Region - As schools prepare to close for the summer holidays, the field team intensified efforts to complete SCH and STH impact surveys in health districts in both the East and South West Regions of Cameroon. These surveys were conducted over a two week period with sample collection beginning first in the East region where 4 health districts - Bertoua, Ndebele, Kette and Doume were sampled. During the second week, the field team travelled to the South West Region, in which samples were collected from 4 health districts -Buea, Tiko, Muyuka and Kumba. The timely success of these surveys in both regions was due in part to the effective involvement of the Regional NTD Coordinators and Inspectors of Basic Education, not forgetting School Directors who assisted the parasitological team in collecting samples from their respective schools in hard to reach areas. Prior to sample collection, all school directors participated in a training where they were briefed on the objectives of the SCH and STH Impact Surveys and informed on the accurate procedure for sample collection. It is important to note that, the collaboration of all actors to the success of these surveys reiterates the general commitment from all parties,in controlling and eliminating SCH and STH in Cameroon. 24 April 2018, Yaoundé, Centre Region - Today, the Coordinator and staff at the control program were pleased to welcome Naomi Caplan and Ben Katzir from the NALA Foundation, accompanied by Dr Oye, Sightsavers Cameroon country Director and Serge Akongo. The NALA - NTDs, Advocacy, Learning and Action - Foundation works to break the poverty cycle of communities around the world by eradicating neglected tropical diseases and other diseases of poverty. Sightsavers along with other civil societies are already actively working with the control program and Cameroon government to alleviate the burden of NTDs in the country. During this visit, the delegation from the NALA foundation discussed opportunities for the foundation to support schistosomiasis and STH control and elimination in Cameroon. 17 - 22 April 2018, North West Region - Up next on the list of regions targeted for the SCH and STH Impacts surveys was the North West, in which three Health districts - Ako, Kumbo East and Ndu were sampled. The North West Region is one of two regions in Cameroon currently affected by some political crisis which have led to insecurity issues. For this reason, the procedure for sample collection in schools differed from that in the previous regions. Those at the forefront of sample collection were school directors who acted as sample collectors in their respective schools while the parasitological team and lab technicians from CSP proceeded with sample preparation and analysis as per their expertise. Prior to commencement of sample collection, the school directors gathered at Ndu Health District where the Regional NTD Coordinator, NW Region alongside representatives from the CSP briefed and trained them on the appropriate sample collection methodology. This involvement from actors from the Ministry of Basic Education reiterates the commitment across sectors, in this fight against NTDs as no one player is sufficient. 18 – 27 March 2018, Littoral Region - Having concluded with the SCH and STH impact surveys in the West Region, the CSP team proceeded with surveys in the Littoral Region where 4 health districts – Loum, Edea, Njombe Penja and Melong were surveyed. The procedure in the region was no different to that in the West Region, with active involvement from actors across ministries – Ministry of Health and Ministry of Basic Education - at regional, district and community levels. 19 – 22 March 2018, Liverpool, United Kingdom - The 4th COUNDOWN Annual Partners’ Meeting was hosted in Liverpool, United Kingdom where colleagues from Liverpool School of Tropical Medicine welcomed over 30 consortium members from partner countries – Cameroon, Ghana, Nigeria and Liberia along with representatives from FHI360 (USA). The 3-day meeting allowed for an informed update on country research activities across multidisciplines including panel-led discussions and interactive group sessions. Some discussions where around stakeholder engagement and policy influence where colleagues stressed on the importance of building inclusive partnerships and responding to obstacles faced by NTD programmes, in order to influence positive policy change for increased NTDs control and elimination. The final day of the meeting included presence from representatives of the Department for international Development (DFID) during which synergies from health systems implementation research – with focus on equity and sustainable integration – undertaken by COUNTDOWN and Centre for Neglected Tropical Diseases were showcased. During the photo and poster walk, preliminary research findings were presented from partner countries with colleagues from our team in Buea wining best poster for “Capturing the Essence of COUNTDOWN”. Read more on the panel-led discussions. 19 February – 08 March 2018, West Region - Following several years of national deworming campaigns, there has been a current need to evaluate its impact on reducing the level of schistosomiasis and STH in school-aged children (SAC) in Cameroon. Through collaboration with partners - Sightsavers/GiveWell and USAID/RTI/HKI- the PNLSHI has organised parasitological surveys to be conducted in schools in selected regions. The Centre for Schistosomiasis and Parasitology (CSP), reference laboratory for schistosomiasis research/diagnosis, has been commissioned to conduct these impact surveys. The CSP parasitological team along with lab technicians began the surveys in the West Region specifically in 5 health Districts – Malantouen, Kouoptamo, Galim, Foumban and Foumbot. Before commencing the surveys, a briefing session was organised at the Regional Delegation of Public Health where representatives for the Delegation of Basic Education and Delegation for Secondary Education along with respective District Medical Officers, and lab technicians from the regional level where informed on the current situation of SCH in the West Region and offered an outline of how the surveys were to be conducted from sample collection to analysis. Continuous collaboration from key actors from the Ministry of Basic Education - Inspectors of Basic Education, School directors and teachers - accounts for the success of the surveys. 29 January – 11 February 2018, Makenene, Centre Region – The health economics field surveyors returned to Makenene, Centre Region where Household Costing surveys were conducted over a 2-week period. These surveys were aimed at identifying the level of compliance and adherence to MDA treatment in the community. The field team visited 484 households where they completed the Household costing surveys with a coverage of 75%. The main issue or limitation experienced during this fieldwork was the absence of many household members during household visits which hindered a high coverage rate. 10 – 12 January 2018, Yaoundé, Centre Region – The 1st Oncho/LF Elimination Committee Meeting was organised by the Ministry of Public Health in Yaoundé, which brought together both national and international public health experts, senior and junior researchers along with representatives from non-governmental developmental organisations working to curb NTDs in the country. Our very own experts Prof Louis-Albert Tchuem Tchuenté, Prof Samuel Wanji and Dr Peter Enyong all members of this committee joined participants to discuss strategies for moving from control to elimination of onchocerciass and LF. The importance of local capacity building, adequate infrastructures and community ownership were stressed as Nigeria shared best practices in its success story in the elimination of Onchocersiasis in two states. One of the main challenges which accounts for the continuous high levels of onchocerciasis prevalence in certain regions is the co-endemicity with loasis which leads to severe adverse effects during mass drug administration. 14 December 2017, Yaoundé, Centre Region – The 7th Meeting of the National Committee for the Control of Schistosomiasis and STH in Cameroon was held at the Ministry of Public Health. This meeting which was chaired by the Minister of Public Health, André Mama Fouda (President of the Committee), had as participants, the Minister of Basic Education, Youssouf Hadidja Alim (Vice President of the NCCSIH), the Secretary of State to the Ministry of Public Health in charge of the fight against epidemics and pandemics, Alim Hayatou in addition to other members of the NCCSIH, partners and key stakeholders. Decisions from the 6th NCCSIH meeting were reviewed and the National Control Program and its partners were applauded for their relentless efforts in the progress made in SCH and STH control in Cameroon. One of the highlights of this meeting was the presentation of the Atlas of SCH transmission in Cameroon, by Prof Tchuem Tchuenté, the National coordinator of the SCH control program which offers an elaborate evolution of the SCH situation in the various regions. The challenge now faced by the NCCSIH and the control program is the abrupt stop of USAID support for SCH and STH control in Cameroon, however, through the continuous commitment from the government and key partners such as Sightsavers, deworming campaigns will be ongoing for school-aged children in all regions of the country as its interruption will be very detrimental. 04 – 18 December 2017, Matta, West Region – Following the completion of parasitological surveys in Matta, results produced served as the sampling frame for health economics surveys as participants were selected on the basis of their schistosomiasis status. Two surveys were conducted in Matta: Poverty and neglected tropical diseases survey; and a program costing survey. The former survey captured data around general household information such as demographics, level of education, household income and assets etc, with 184 households being surveyed with a response rate of 86.38%. While the latter survey gathered information around costs and implementation of MDA in the area as it was administered to key informants such as Chief of Post, community leaders, school principals, head of health committee in addition to volunteers – community drug distributors, schools teachers and community health workers. 24 program costing surveys were administered. Some issues which affected the response rate of the surveys included: absence of household members during home visits and refusals to offer consent. 27 November - 03 December 2017, Matta , West Region -Evaluation surveys were conducted in Matta, Malantouen Health District, in order to evaluate the effect of deworming campaigns in the region as well as provide information needed for health economics sampling framework for the COUNTDOWN project. These parasitological surveys were conducted firstly in schools, through the assistance from school directors and teachers wo are key players in the control of schistosomiasis and STH, as they act as drug distributors during deworming campaigns in schools. Subsequently, community-based parasitological surveyors were conducted through assistance from the Chief of Post along with community drug distributors who accompanied the field team into the community. This emphasizes community ownership of activities. All samples for the surveys were collected and analyzed by the team from the Centre for Schistosomiasis and Parasitology. 14 - 17 November 2017, Yaoundé, Centre Region -A health economics training workshop was organized in Yaoundé during which 15 field surveyors were trained around the best practices and techniques for effectively administering health economics surveys using the SurveyCTO software. The surveys developed for COUNTDOWN research will capture data required for the analysis of the economic burden of NTDs at household level; data to study the value for money of the investment in NTD interventions; as well as identify opportunities for planning, upscaling and integrated implementation at the national, district and community levels. Through interactive role playing, surveyors were able to improve their survey-administering skills as well as experience scenarios of dealing with challenging personalities son the field. This workshop was facilitated by Dr Michèle Estelle Ndonou Health Economics lead alongside Dr Maame Woode, LSTM. 22 - 26 October 2017, Centre Region -Parasitological and epidemiological surveys which were undertaken in schools in Ndikinimeki Health District, recorded a high prevalence of schistosomiasis in some areas in the district. This led to the decision of a district-wide community based mas drug administration of PZQ and ALB. The district is composed of 6 health areas: Makenene, Nitoukou, Nyokon, Ndokowanen, Ndikinimeki, and Boutourou. Prior to this MDA, a training session was organized for supervisors and CDDs which was facilitated by the District Medical Officer and the Chief of Health Bureau. The MDA was conducted over a week with community sensitization being done using various channels such as religious settings – church and mosque – and via megaphone. 11 – 16 October 2017, Yaoundé, Centre Region - The National Programme for the Control of Schistosomiasis and STH organized a National SCH Technical Meeting in Yaoundé, chaired by the Coordinator of the control programme, Prof Louis-Albert Tchuem Tchuenté. In attendance were the Regional NTD Coordinators from all 10 regions of the country as well as representatives from civil society organisations – HKI, Sightsavers, Perspectives and International Eye Foundation. Participants were briefed on the current situation of SCH in the country and results from COUNTDOWN related research activities served to guide some discussions around plans moving forward (from control to elimination) and to reinforce the need for more effective efforts from all participants, in the control of SCH and STH with emphasis on the use of multidisciplinary approaches for better impact. Through the interactive working session, the national database for schistosomiasis and STH activities in Cameroon was updated. 10 - 19 August 2017, South West Region - The Barombi crater lakes are renowned foci for schistosomiasis transmission and thus have been selected as study sites for the COUNTDOWN schistosomiasis and soil-transmitted helminthiasis-focused research. In line with planned COUNTDOWN activities, mass treatment with praziquantel against schistosomiasis and mebendazole for intestinal worms took place in Barombo Kotto and Barombi Mbo communities. This 2 week activity consisted training of community drug distributors and sensitisation of opinion leaders which was facilitated by the Regional NTD Coordinator, SW , the District Medical Officer and Chief of Post at the Health Centre. The church played an invaluable role in community sensitisation, as well as opinion leaders - traditional leaders, quarter heads, church leaders, women leaders and youth leaders - who positively influenced community adherence. However, the group charged with the ultimate success of MDA were CDDs who worked enthusiastically and effortlessly to rid the community of the burden of schistosomiasis and intestinal worms. In addition to MDA, the health economic team carried out household surveys while the social scientists captured perceptions around control interventions via key informant interviews and focused group discussions with variety of community groups - women, elders, youth, farmers etc. August 2017, Yaoundé - Prior to mass treatment of communities in Barombi Crater lakes in the South West Region, a work plan meeting was organised at the COUNTDOWN country office in Yaoundé. Participants included the Regional NTD Coordinator, South West Region, Mrs Bea Mukete and personnel from the National Programme for the Control of Schistosomiasis and STH. The work plan guiding the implementation of the community-wide mass drug administration in both Barombi Kotto and Barombi Kotto were reviewed and finalised through guidance from Mrs Mukete. All community drug distributors training manuals and distribution tools – registration forms, dose pole - were revised. Each theme – parasitology, epidemiology, health economics and social science – offered insight into planned activities for said location resulting to clear integration of activities. 03 July 2017, Yaoundé - Colleagues in Yaoundé got together for a working session during which they reviewed work plans and finalised action plans moving forward. This session allowed for better synergy between the parasitology and social science disciplines. Clear action plans and timelines for planned field activities were set enabling close collaboration and effectiveness of activities. Social science colleagues informed on preliminary findings from data collected thus far, through engagement with various stakeholders both at Regional and District level. These findings will guide future research activities and community engagement. 31 May - 04 June 2017, Makenene - Completion of COUNTDOWN baseline studies continues as the team visited Makenene, Centre Region for community-based sample collection. This was in accordance with planned activities for the Integrated complementary strategy theme -2. An initial community cross-sectional study is required to assess the baseline infection and morbidity status of both schistosomiasis and STH in the community. Makenene is one of the study sites selected for extended treatment of praziquantel (for schistosomiasis) and mebendazole (for STH). The success of activities in the community was due in part to local collaboration from community drug distributors who were at the forefront of community sensitisation. The community working for the community emphasises the idea of community ownership which in turn allows for full engagement and adherence of community members to the schistosomiasis control activities. 22 - 30 May 2017, Barombi Kotto - Accompanying the CSP team for planned COUNTDOWN activities, the team from LSTM travelled to Barombi Kotto village, in the South West Region. The Chief of Barombi Kotto and his village elders were very welcoming as usual and before any work could commence, an introduction and sensitization session was organized at the community hall for the entire community. LSTM Masters students offered overviews of their research, highlighting the objectives and how the samples collected from the community will be utilized. The Chief understands first hand the burden which schistosomiasis causes to his people and he expressed his total commitment and support to working with the COUNTDOWN project to curb this debilitating diseases. The whole community was fully engaged and adhered to all aspects of the various research activities and this was due for the most part, to the proper sensitization offered before commencement of activities. All samples collected were analysed on the ground at the community Health Centre. Furthermore, Christine Makia made advances around social science-related aspect of the COUNTDOWN research by capturing the perceptions of stakeholders and lay people around schistosomiasis control interventions. She carried out in-depth-interviews and focus group interviews with some stakeholders being the Chief of Barombi Kotto, Head of the Nigerian community, Community Youth Leader, traditional leader and the Chief of the Health Centre. 18 -19 May 2017, Yaoundé - The COUNTDOWN Social science team in Yaoundé organised a two-days working session with Dr Martyn Stewart around resources for analysis and paper writing. The team consisted Prof Estelle Kouokam, Marlene Siping, Marlene Ntshinda and Christine Makia. During the course of this intensive working session which took place at the COUNTDOWN country office, colleagues presented findings obtained from preliminary research carried out in Edea, Littoral Region. This study also served to test data collection tools and Dr Martyn shared knowledge around qualitative analysis, equipping the team with the ability to succinctly analyse qualitative data. 17 May 2017, Yaoundé - Growing partnership between CSP and Liverpool School of Tropical Medicine (LSTM) has led to numerous opportunities for mutual capacity development and knowledge exchange. This was recently the case, as Prof Louis-Albert Tchuem Tchuenté and team at CSP welcomed colleagues and Masters students from LSTM for further collaboration around schistosomiasis research. LSTM team consisted Drs James LaCourse and Martyn Stewart alongside students, Grace Macklin, Lisa O'Halloran and Zickmund Bartonicek. The main aim of the visit was to further the research agenda around schistosomiasis control, as the Masters students partnered with the CSP to conduct field studies in line with their final research projects. 27 March - 14 May 2017, Centre Region - It has been a very busy period for the team at CSP, which are progressively finishing off the COUNTDOWN schistosomiasis baseline studies in school-aged children and in communities. These studies will offer information on the prevalence of schistosomiasis in the selected COUNTDOWN study sites and will guide work around the alternative interventions to be carried out. Study Sites are located in Four Regions - Centre, Littoral, West and South West. The collection of urine and stool samples from school-aged children is highly facilitated by school Directors and teachers, who are key players in the control of schistosomiasis. These efforts further highlight the commitment of partners - the Ministry of Basic Education and Ministry of Secondary Education - to the tripartite partnership signed with the Ministry of Public Health, and the Union of United Cities and Councils of Cameroon, for the control of schistosomiasis and STH. For more information about this COUNTDOWN research, visit the COUNTDOWN Cameroon website. 20 April 2017, Buea- The COUNTDOWN team in Buea alongside our partners -the University of Buea, hosted a Regional Advocacy and Stakeholders meeting which brought together government officials and officials from civil society organisations - Helen Keller International and Sightsavers. In addition were Deans from the University of Buea, teachers and students all interested in combatting NTDs in the South West Region. In her welcome word, the Vice Chancellor of the University of Buea who presided the meeting, stressed and encouraged researchers to ensure that research information is always relayed back to the communities concerned. The Director of Disease Control, Ministry of Health reiterated the government's commitment on NTDs control and fortified youths to be proactive in this fight. The COUNTDOWN team in Buea led by Prof Samuel Wanji, offered elaborate narratives of the overall COUNTDOWN project with emphasis placed on the alternative strategies for the acceleration of Onchocerciasis in Cameroon. Before officially launching the COUNTDOWN activities in the South West Region, the Governor informed on his "unconditional support" to all COUNTDOWN activities. A highlight of the meeting was the onchocerciasis exhibition where participants where enlightened around onchocerciasis. 28-30 March 2017, Yaoundé - The 3rd COUNTDOWN Annual Partners' Meeting was hosted in Yaoundé, Cameroon at Mont Fébé Hotel. The team in Cameroon welcomed partners from Liberia, Nigeria and the United Kingdom, while partners from Ghana were unfortunately unable to attend the meeting due to unforeseen circumstances. The 3-day intensive and interactive meeting allowed COUNTDOWN colleagues to review progress on work carried out thus far, all the while planning actions for research activities moving forward. 22-23 March 2017, Yaoundé - The 1st International conference organised on Schistosomiasis in Cameroon was held from Wednesday, 22nd March 2017 to Thursday, 23 March 2017 at Mont Fébé Hotel, Yaoundé. This conference titled Toward Elimination of Schistosomiasis (TES) brought together over 80 experts, scientists, donors, policy makers, non-governmental development organisations and students from all over the world to share and learn from each other's experiences and perspectives. 07-10 February 2017, Yaoundé - The COUNTDOWN team in Yaounde have welcomed colleagues from Buea and Nigeria for a 4-Day Evidence Synthesis Workshop which aims to enable participants to understand, appraise and use systematic reviews in neglected tropical diseases .This workshop is facilitated by Prof Pierre Ongolo-Zogo, Dr Villyen Nkengafac and Patrick Owen from the Centre for the Development of Best Practices in Health. 27 January 2017, Yaoundé - The Head of State, Grand Master of National Orders, raised Professor Louis-Albert TCHUEM TCHUENTÉ to the dignity of Commander of the National Order of Valour, on the occasion of the National Day of 20 May 2016. The Minister of Higher Education officially awarded the decoration during the presentation ceremony of New Year 2017 wishes held on 27 January 2017 at the Amphitheater 700 of the University of Yaoundé I. 24-25 January 2017, Yaounde- The COUNTDOWN team in Yaounde hosted colleagues from Buea, for a 2-day Social Science meeting. The purpose of this meeting was to review research activities against the timelines, review data collection tools and ensure reflection and co-ordination with both the Yaoundé and Buea research teams. 06-30 November 2016, Edea and Eseka - Staff members alongside PhD and MSC students from the Centre for Schistosomiasis and Parasitology (CSP) have been very busy with field visits to Edea and Eseka in the Littoral Region. These visits were for the purpose of schistosomiasis sample collection for parasitological studies ongoing at CSP. Samples were collected from school-aged children in schools as well as members in the community. 29 October 2016, Yaounde - Every year, Prof L.A Tchuem Tchuente, Director of CSP, organises practical training for his Masters students from the University of Yaounde I. This allow students to put theoretical knowledge into practice. This year, the practical training course consisted of a field visit to a schistosomiasis transmission site where MSc students experienced first hand the realities of schistosomiasis transmission, and challenges for disease control and elimination. In addition, through the assistance from members of CSP, students carried out malacological surveys and snail identification followed by capacity building on schistosomiasis diagnostic techniques - Kato-Katz, CCA, Hemastix, and urine filtration. 26 -27 October 2016, Yaounde - A 2-days training course in malacology and use of molluscicides for snail control was carried out as part of the China-Africa meeting. The Director of CSP, and Coordinator of the National SCH Control Programme, Prof Louis-Albert Tchuem Tchuente led Chinese and African partners to a schistosomiasis transmission site in the city of Yaounde, where partners carried out malacological surveys with help from experts Dr Henri Madsen, University of Copenhagen, Prof David Rollinson, Natural History Museum of London, and Dr Rabiou Labbo, RISEAL Niger. Following this training course, Chinese and African partners were able to strengthen their capacity on schistosomiasis diagnostic techniques at the CSP with help from the team at CSP. 24 -28 October 2016, Yaounde - The second meeting of the China-Africa Cooperation on Schistosomiasis Elimination took place this week at Hilton Hotel in the capital city, Yaounde. This cooperation aims to strengthen collaboartion between African and Chinese research institutions, in order to scale up schistosomiasis control and elimination through the agreement between the National Health and Family Planning Commission of China and the Department of Control of Neglected Tropical Diseases in the World Health Organisation. The meeting included a 2-days training course in malacology and use of molluscicides for snail control, with activities being carried out at the Centre for Schistosomiasis and Parasitology (CSP). 02 August 2016, Yaounde - Communication is an invaluable tool which serves to raise awareness and sensitise the population, around the control and elimination of NTDs in the country. Prof Tcuem Tchuente joined the team of 'CRTV m'accompagne' at the national radio station to discuss the importance of building health reporting capacity within the media around NTDs. Schistosomiasis and other NTDs continue to pose problems for some populations around the country, but educating the public helps them to be aware of transmission and how to prevent it. For more information about schistosomiasis, please click here. 23 - 28 July 2016- The National Programme for the Control of Schistosomiasis and STH organised a 6 days NTDs training session for journalists from national and regional levels. Prof Tchuem Tchuente, permanent secretary of the programme believes that "communication plays a very big role in raising awareness, controlling and eliminating NTDs". The training session consisted field visits to various schistosomiasis endemic sites as well as areas which have managed to eliminate the disease, hence becoming success stories. Journalists were able to experience the challenges and realities faced in order to reach populations most affected. All the communities and traditional leaders visited, warmly received the team and expressed gratitude for the government's effort in hearing their voice and improving they health status. 19 July 2016, Edea, Littoral Region - Prof Louis-Albert Tchuem Tchuente attended a working session with the directors of the various health areas in the Edea Health District, in the Littoral Region ahead of a planned mass drug distribution. This working session organised by the National Programme for the Control of Schistosomiasis and STH demonstrates the government's incessant commitment in improving the health status of the population. Prof Tchuem Tchunete commended the directors for their relentless hard work and reiterated that 'in order to interrupt transmission of schistosomiasis we have to deworm the whole community, not just school-aged children'. 07 June 2016, Yaounde - The annual stakeholders NTD work plan meeting brought together both international and national stakeholders involved in the fight against neglected tropical diseases. These stakeholders comprising the National Programme for the Control of Schistosomiasis and STH, National Programme for the Control of Onchocerciasis, Helen Keller International, RTI International, Perspective, Sightsavers, and International Eye Foundation discussed the implementation the Envision project for 2017. This 8-year USAID funded project aims at providing assistance to the NTD control programs for the control and elimination of NTDs so that they are no longer a public health problem. 01-08 June 2016, Barombi- A team from the Centre for Schistosomiasis and Parasitology led by Prof Tchueme Tchuente went on a week's study field visit to Barombi, south west Cameroon accompanied by Prof Russ and the team from LSTM. The comparative study aims at evaluating the level of schistosomiasis transmission in two sites: Barombi Mbo and Braombi Kotto. The team received warm welcomes from the chiefs and community of each village and were able to raise awareness and inform them of ways to interrupt transmission. All samples collected from the community were prepared and analysed by using various diagnostic techniques. 31st May 2016, Yaounde- Growing collaboration between the Centre for Schistosomiasis and Parasitology (CSP) and Liverpool School of Tropical Medicine (LSTM) offers the platform for training and knowledge sharing as has been the case today. Prof Russ from LSTM performed the Baermann diagnostic technique for the first time at the CSP where students from both CSP and LSTM were able to learn and develop their capacity. The technique makes use of stool samples to test to test for the presence of schistosomes. 30 May 2016, Yaounde- A team of MSc students from Liverpool School of Tropical Medicine (LSTM) led by Professor Russell Stothard and Dr James LaCourse are currently visiting Cameroon where they shall be collaborating with Prof Louis-Albert Tchuem Tchente and his team at the Centre for Schistosomiasis and Parasitology. Close ties forged between both institutions allows for knowledge transfer and capacity building around schistosomiasis research. The team is currently preparing for a study field visit to Barombi, in the South west region of Cameroon. 24 - 27 May 2016, Edea - A 10-person team from the Centre for Schistosomiasis and Parasitology and University of Yaoundé I, travelled to the city of Edea, in the Littoral region to conduct an evaluation study. This study is aimed at evaluating the level of transmission of schistosomiasis and the efficacy of praziquantel treatment provided during the annual national deworming campaigns. Over a four-day period, the team collected a total of about 1600 stool samples from about 75 schools within the various divisions in the Edea health district. All samples were prepared for analysis using the kato-katz technique. 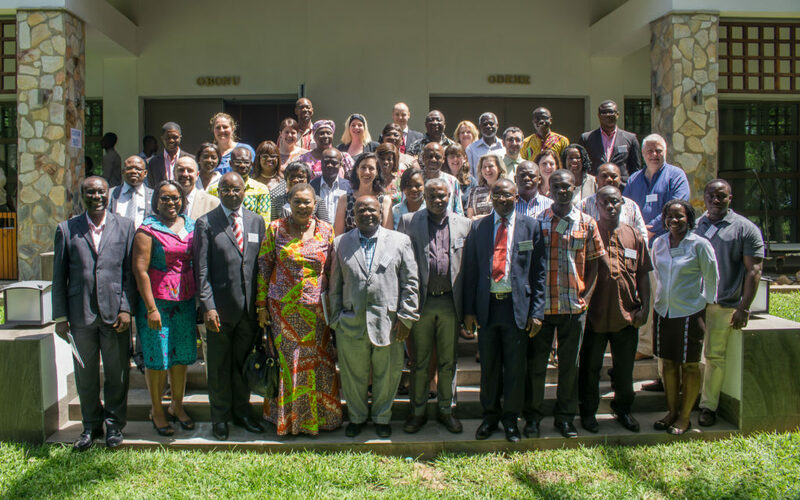 20-22 April 2016, Accra, Ghana - COUNTDOWN country partners gathered in Accra, Ghana for the consortium's first annual partners meeting. During this 3-day meeting, partners were able to look back at the progress made thus far, review work plans and develop outputs which aid in attaining end goals for respective countries. 09 March 2016, Yaounde - The 2016 National Deworming campaign was launched today, by his Excellency, the Minister of Public Health, Mama Andre Fouda alongside her Excellency, the Minister of Basic Education,Youssouf Hadjidja Alim. This free deworming of school-aged children in all ten regions of the country is in line with the activities implemented by the National Programme for the Control of Schistosomiasis and soil-transmitted helminthiasis (STH) and serves to rid the Cameroonian people of the burdens incurred from schistosomiasis and STH. 23 - 26 February 2016, Nairobi, Kenya - The Grand Challenges Africa (GCA) meeting brought together grantees funded by the Bill & Melinda Gates Foundation, Grand Challenges Canada and the USAID, to share ideas and experiences to help define the shape and focus of GCA and potential challenges, and how GCA can drive the innovation necessary to achieve the continent’s long-term Sustainable Development Goals. 26 - 31 January 2016, Bangkok, Thailand - CSP Director,Prof Tchuem Tchuente attended the PMAC 2016 on "Priority Settings for Universal Health". This conference gathered a total of 847 participants from 63 countries where there were interesting debates, including cost-effectiveness vs human rights considerations for setting priorities in health. 28 January 2016, Suan Luang Municipality, Kratumban District, Samut Sakhon Province, Thailand - A one-day field trip was organized to different sites, offering participants the opportunity to directly interact with persons in charge of policy decisions and implementation in real life, and to get an insight into Thailand’s health systems including care delivery, financing and management. 01 December 2015, Yaounde - Professor Louis Neissen, Chair of Health Economics at Liverpool School of Tropical Medicine, facilitated a discussion with the COUNTDOWN Cameroon team around the equity impact of the scale up of Mass Drug Administration and sustainable complementary strategies for this scale up. 01 December 2015, Yaounde- Prof Louis Neissen and Prof Tchuem Tchuente visited the Permanent Secretary for the Ministry of Public Health, at the Ministry of Public Health. This encounter enabled discussion around better understanding the NTD programmes in Cameroon, surveillance system, availability of data, applicability of economic impact measurements and ways to implement health economic research in Cameroon at household level. 01 December 2015, Yaounde - The COUNTDOWN team along with Prof. Louis Neissen paid a visit to the Faculty of Sciences at the University of Yaoundé I, where they were able to learn more about the research being conducted at the faculty, around parasitology research in Cameroon. 13 October 2016,Yaounde- COUNTDOWN Cameroon and Liverpool team members visited the village of Kinding Ndjabi, 3 hours West of Yaounde. This is an example of a success story of interruption of schistosomiasis through the installation of a water pump and other interventions. Discussion with the village chief clearly indicated that the pump had brought many health benefits to the local community with those affected now largely free of the signs and symptoms of disease. 12 October 2015, Yaounde - As part of the COUNTDOWN project activities in Cameroon, a workshop on research uptake was held in Yaoundé. The workshop gathered COUNTDOWN team members from Liverpool School of Tropical Medicine (LSTM) and Cameroon (Yaoundé and Buea teams) to discuss and share research uptake strategies, tools and perspectives. 09 October 2015, Yaounde - The COUNTDOWN project was launched today in Cameroon at the Ministry of Public Health. This launch was presided by the Minister of Public Health, his Excellency, Andre Mama Fouda. COUNTDOWN is a programme of implementation research to inform the effective and sustainable scaling-up of integrated neglected tropical disease control initiatives. The implementing partners in Cameroon are, the Ministry of Public Health, Centre for Schistosomiasis and Parasitology, University of Buea and University of Yaounde I. 05 October 2015, Cape Town, South Africa - A memorandum of understanding on co-operation in establishment of institution-based network on China-Africa Cooperation for Schistosomiasis elimination, was signed between China and African institutions. 25 - 27 August 2015, Yaoundé – As part of the COUNTDOWN project activities in Cameroon, a social sciences workshop was held in Yaoundé, to develop protocols and a work plan for social sciences research, including defining the role and responsibilities of staff involved. Participants included COUNTDOWN staff from Liverpool School of Tropical Medicine (LSTM), Buea and Yaoundé. 08 - 12 June 2015, Yaounde - Working visit of Rachael Thomson and Julie Irving to Cameroon to discuss the inception work-plan, activities, budget allocation, COUNTDOWN operational manual, and reporting requirements.